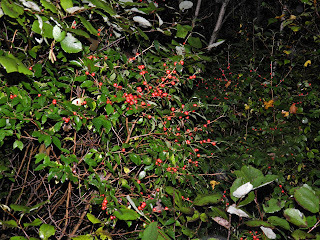 Ilex verticillata (Winterberry) is a species of holly native to eastern seaboards of the United States and Canada. Until September comes, it’s very easy to miss. But once the berries turn red the opposite is true. 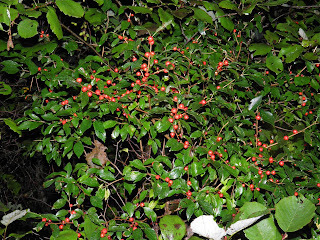 Winterberry is a shrub that grows between 3 and 15 feet high. I have never seen one over 10 feet. Unlike European Holly (Ilex aquifolium), Winterberry is deciduous, losing its leave in the Autumn. 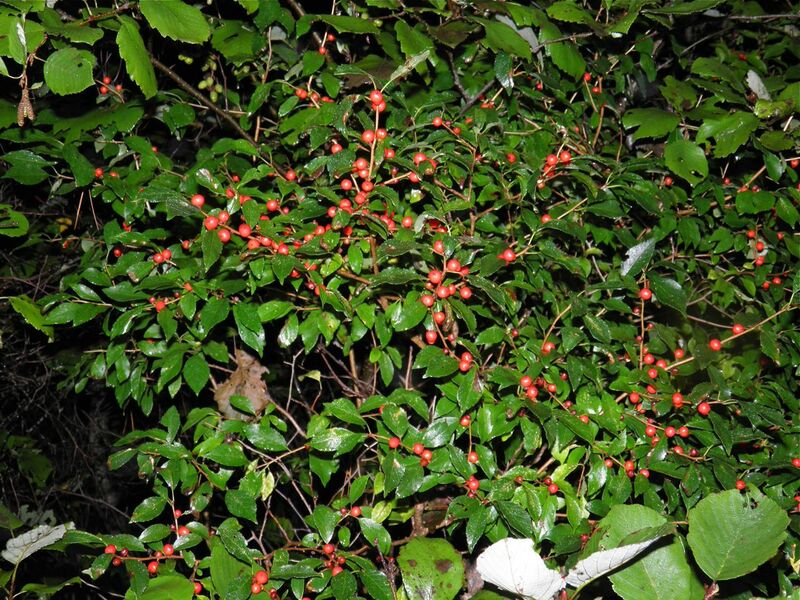 Winterberry grows in both dry and wet conditions, but is more compact where the soil is on the drier side. Like its cousin, the leaves are shiny green, but they do no bear the sawtooth marks characteristic of the European variety. The flowers are small and white and are followed by round green berries which ripen to the characteristic red in early Fall. The berries are only borne on the female plants. Like most hollies, it is “dioecious,” which means there are separate male and female plants. At least one male plant is required close by to pollenate the females in order to bear fruit. The entire Winterberry plant contains a mild toxin called theobromine, an alkaloid nearly identical to caffeine in coffee. The greatest concentration is in the berries. 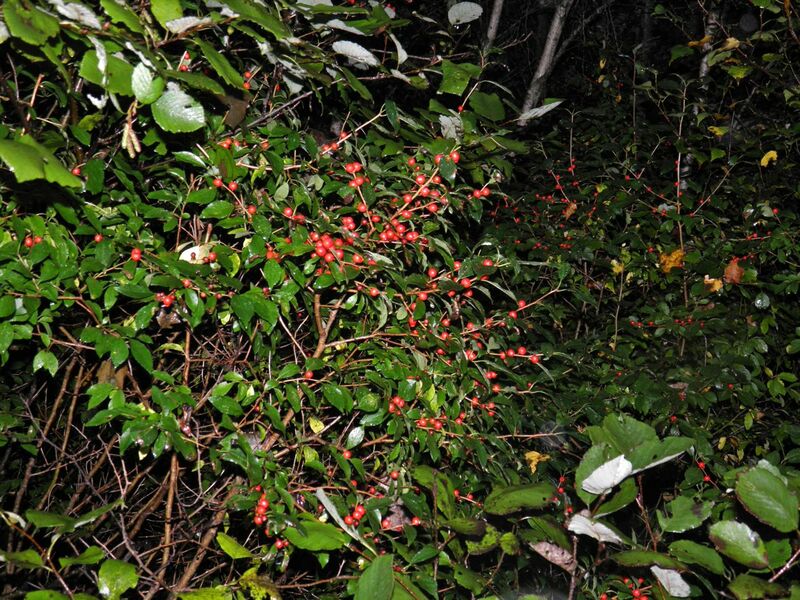 Before you rush out to make your own brew, be aware that Ilex verticillata is on the poisonous plant list in Nova Scotia and many studies will need to be conducted before the plant is deemed safe for consumption. Like other caffeines, large concentrations of theobromine can cause dizziness, nausea and diarrhoea. The winterberry is prized for the midwinter splash of bright colour from its berries, whose visibility is increased when the leaves drop off. The bare branches covered in berries are also popular for cutting and use in floral arrangements. Many people sell Winterberry at the local Farmers Markets. They usually start to appear now, or a little later in the season. 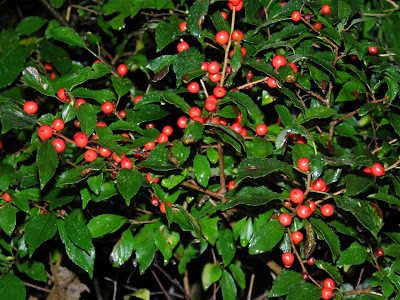 Winterberry is a tough plant which is easy to grow, with very few diseases or pests and it will grow in the average garden. Birds do seem to like to eat the berries, so be warned. They may start to disappear! If my experience with European holly is any indication it appears that the male plants are the “bushier” of the two. Unfortunately you do not get berries on the males. My suggestion would be to plant several of both so you get the best of both worlds.